Deep and classy, warm and spicy is how this precious fragrance comes across. Bright and enticing as the summer sun, it opens with a fruity blast. Even as you negotiate this sucker punch, fresh, floral middle notes kick in. Sublime woody notes finally make a graceful appearance to turn your soaring joyride in to a silken glide. 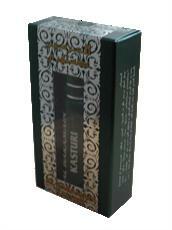 Beyond doubt, Al Haramain Kasturi is to a perfume cabinet what that resplendent solitaire is to a jewelry box. I don't know what "Kasuturi" means.. and don't care about this house. but THIS fragrance is perfect. very pleasant and fresh smells, highly recommend to someone who searching for like John Vavatos artisan or Allure homme sports by Chanel. It's better!! This fragrance is one of my jewels. It's a little sweet but the spiciness, potency is very pleasant; I recommend this oil to anybody who appreciates a unique scent...set yourself apart the rest! One of the best I ever tired. Must buy for body oil lover.